Okay, where were we? Ah yes. We just finished the kitchen and the ’80s wallpaper (some of it). Next is the livingroom. I like the livingroom. I mean, there’s work to be done in here, but it’s not so bad. For starters, I love the fireplace, which burns wood like a real fireplace. I love that–the smell and crackle of the wood fire. On the other hand, you can’t flip a switch and get the wood fire. That’s okay, though–that’s what husbands are for. I’m going to buy firewood this week so Frank can build me a fire, because we are apparently skipping fall and going right to winter after having a very hot September (it was in the 90s most of the month!). I might want to paint the mantel white or black, but I haven’t decided yet. And I’ve been inspired by sheila and have decided that the long wall there needs to be covered floor-to-ceiling in built-in bookshelves (except where the TV armoire will go in the center). 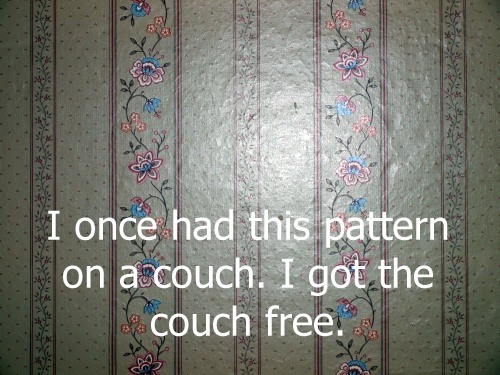 As you can imagine, I’ve already started ripping off the wallpaper. Underneath the paper is a nicely textured wall (!!) and pale yellow paint. Off the livingroom (and kitchen) is what is currently a reading cave and may have been a tiny dining room in the past. All the bookcases are in there now, and I haven’t actually done any reading in there, but… you know. I could if I so wished. 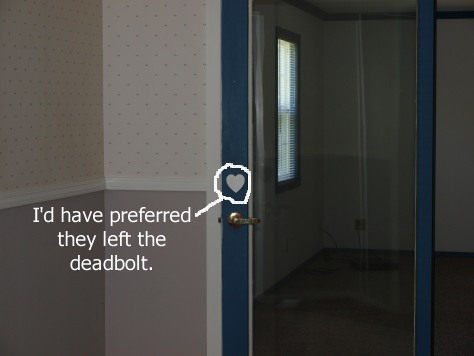 I’m pretty sure this fancy little decoration used to be a deadbolt, because this was the back door, and the gameroom is an extension. What I do love about the door is that it’s pretty well soundproofed, since it used to be an external door. So sometimes Frank goes in the gameroom to write while I bang around in the kitchen with Buffy blaring on the TV so I can listen to slayage while I cook. And when Tarina visited, she went off to bed in the guest room one night, and Frank and I shut ourselves in the gameroom and karaoked for a while. Tarina never heard a peep. So that’s cool. Oh, and this room, too, has wallpaper. I sense a theme: Home is where the creepy heart wallpaper is. Next is the gameroom, which I love. Only… I don’t understand the color scheme. Blue trim, doors, moulding… white walls. Something a little backwards about that. I mean, I could understand if the walls were orange, because hey, BSU colors. But no, it’s white on country blue. 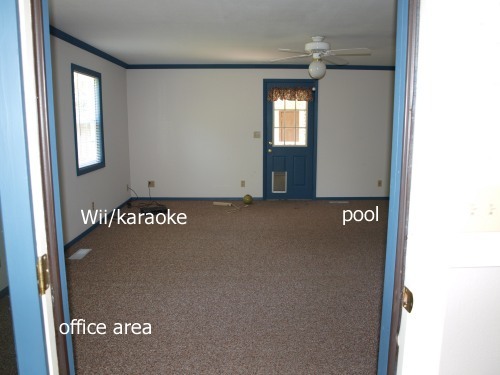 Anyway, we have our office area when we first walk in, then the Wii/karaoke area, and then the other wing of the room is where the pool table will go once I’ve moved all the boxes out of that space. The pantry is actually in the gameroom, and I’m glad it’s there. The house didn’t originally have one, so at least there’s one around the corner, even if it’s not in the kitchen. Do you love the valance on the back door? It’s blue/maroon with flowers and stuff. I might cover the walls in that fabric. I’ll want to paint in here, replace the light fixture (not my style), and eventually replace the vanity, but it’s fine for now. Oh! And the floor–I don’t have a picture–is grey linoleum stick-on tiles with diagonal darker grey designs. The other bathrooms also have stick-on tiles, but they look fine. 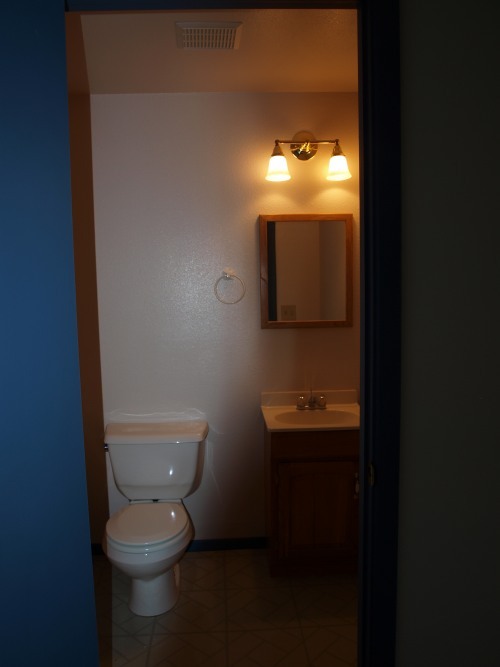 And the blue trim is all over the powder room, and the door is blue. Next, we’ll tour the bedrooms. This entry was posted in Home improvement, life in idaho, Moving. Bookmark the permalink. I love that fireplace! I think painted fireplaces are nice. We painted our bricks green when we had a fireplace and it really looked cute (not so much in style now. I think white is in again). That wallpaper has got to go. It’s like a bad itch. I really like your house and that reading cave is going to be a nice retreat. love the house. yeah, I’d be painting some earth tones in a hurry. 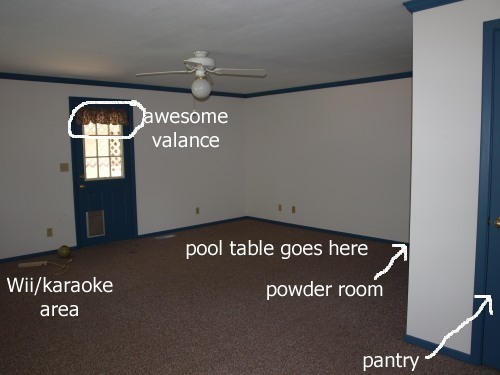 It’s good Frank’s pool table and your Karaoke with have their own room. That’s cool! Like the house. 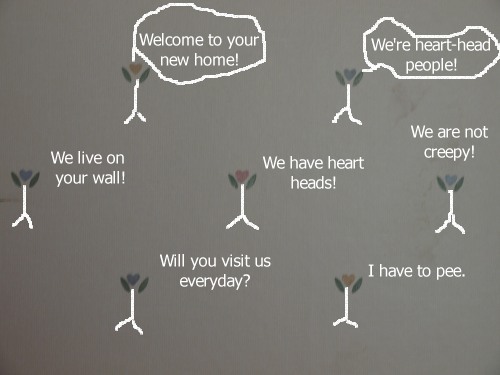 Particularly the heart-head people wallpaper. Jona, I really like these bricks the way they are. I want to replace the fireplace container with black instead of brass. 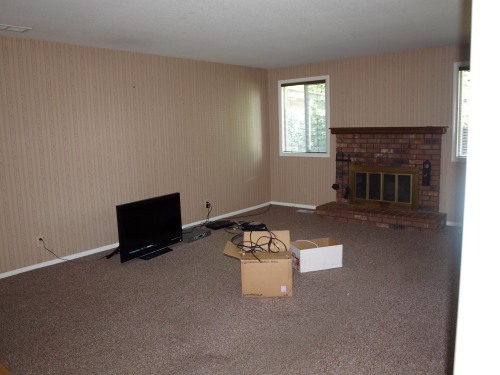 Our entertainment center is black, so we might do black bookshelves, a light color on the walls, and a black mantel. I haven’t decided. If we do black shelves and mantel, I feel like we’d have to do dark baseboards, and I don’t know if I can do that. Man, all the wallpaper in this house isn’t even livable, not for a minute. Ma, painting earthtones for sure. We like having the gameroom too. I love all of our extra rooms. Walter, ha! No, you’re supposed to hate the heart-head people! I admire all of your plans. We bought our home knowing that we’d have to fix/change so many things. We were first-time homebuyers and quite naive in that regard though because I completely failed to factor in my laziness when thinking about all the fixes and changes we needed (and still need) to do. We’ve gotten a lot done, but there is oh, so much more to do. 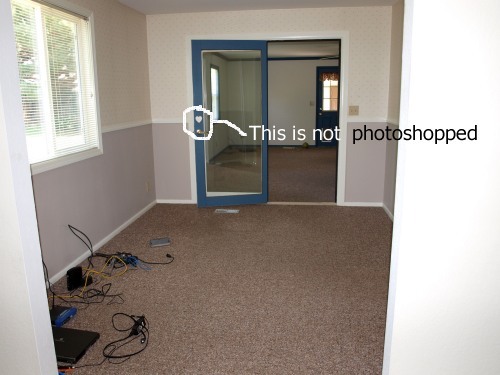 If/when we buy another home we’re looking for one that needs little-to-no updating. I’m tired of being housebroke. We fixed up our Florida house to sell it, knowing we weren’t going to get to enjoy much of it, and we learned a ton about home improvements during that little venture. So now we’re excited about fixing up this house since we’re planning to live in it for a long time. We’ll only be able to do a little at a time, and right now what we’re doing is any grocery money left over goes into house-improvements budget. I have enough for one can of paint right now. Haha. When I get enough for two cans of paint and two sets of miniblinds, we’ll be able to get started. But I’m not allowing myself to get started until everything is unpacked, so that’s motivation. Because I’m not planning to look at this wallpaper for very long! I’m trying to decide whether to attempt building the bookshelves myself or hire someone to do it. It will probably come down to price. If Frank’s handy like that; building them yourselves will be far cheaper. Considering you’ll only have to buy materials and will be able to build them exactly how you want, it’s the way to go. If you’re like me and basically only fix simple things, it might be too much. There’s a ton of information online about building built-in shelves and the Home Depot homeowner’s book has a good piece on it too. Look into local auctions. You can get bookshelves for pennies on the dollar and paint them! Plus auctions are fun! Also…You can paint the trip bright white no matter what color you use anywhere. It accents black, brown, whatever better than anything you can add to the room! cause I say. and so does HGTV. I bought my house 7 years ago. The Little Old People I bought it from had never painted it. It was built in 1962 and most of the house was still in builder’s beige! Where they did do some redecorating, it was in the 80s with really awful wallpaper. All of the above is long gone. We paid to have the LR and Dr painted as there is a vaulted ceiling. My SO said that the longer he looked at it, the higher it got. The guy did a great job and it still looks great. I highly recommend Sherwin Williams paints! They last a long time! Good luck with your projects!! Just how OLD were the people who lived there before you??? The color scheme. She hurts me. But you’re gonna make it great. Or I won’t come visit. I’m so jealous that you have your own home. We are stuck in rent heck while we finish paying off bills. Oh well, maybe the housing market will stay down for a while and when we are ready to buy there will still be good deals.